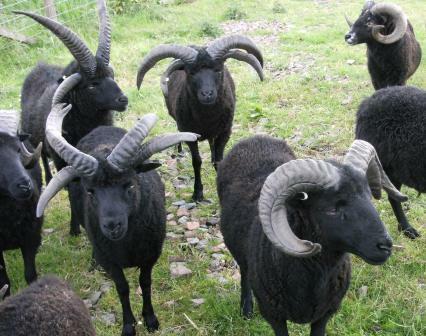 Hebridean sheep were originally predominently a four-horned breed. Over the years, two-horned sheep have come to dominate the breed to the extent that about 95% are now two-horned. Four-horned sheep display a wide range of horn styles and a great variety of types of fleece, rather more so than two-horned sheep. Only four-horned sheep have topknots. Topknots are so rare now that there are probably less than a dozen registered topknot sheep in existence. We are determined to preserve these ancient characteristics. (In the header picture, the eagle-eyed may spot a couple of black Soay sheep. Look for the short fleeces and short tails). Storrs Hall Flock - the first known photograph. 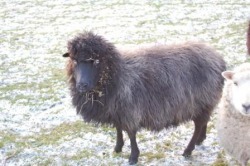 This is what Hebridean Sheep originally looked like. Over the years, relentless selection for jet black 2 horned sheep, whilst producing some stunning animals for the show ring, has resulted in sheep like these becoming incredibly rare. Note particularly the original fleece type and colour distribution. At Wester Gladstone, we are desperately trying to keep the original type of sheep alive. Photo courtesy of Dr David Kinsman. Another early photograph of the Kilmory flock in Scotland, again showing the original characteristics. The Storrs Hall sheep show black faces, briskets and undersides with the back and flanks being silver grey. 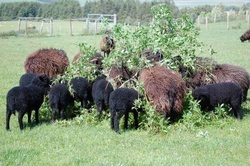 Some sheep, as shown here, still exhibit this original type of fleece. This is becoming increasingly rare due to the showring preference over many years for a uniform black fleece - which I suggest is unfortunate and has led to a change in what is viewed as the correct fleece type for the breed. Compare Gladstone Laughing Boy (2005-2015) with the tup shown on the right in the Storrs Hall picture. Laughing Boy was not a 'show' sheep but we believe that he was about as close to the original Hebridean type as possible. 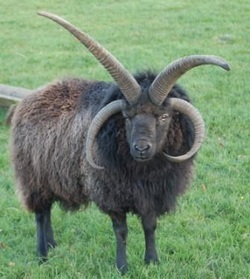 If you look closely you will see that he had a top-knot himself somewhere amongst the horns and he has sired a number of topknotted lambs as well as countless multihorned lambs and had the gentle nature important for a farm animal with such an impressive horn set. We use 4 or 5 different tups, each with a small group of ewes, every tupping season. This ensures that we maintain genetic diversity within our flock and avoid consanguinity. By 4 Horn we really mean polycerate - 'multi-horned'. Within the general term 4-horned, you can also get 5, 6, and very rarely 8 horns. And to add to the confusion, polled hebrideans (no horns at all) are genetically 4-horned. So really we should use the term polycerate. 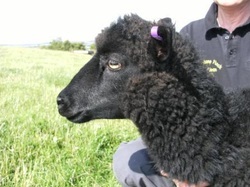 Here is a 6 horned lamb bred by us a couple of years ago . She has since been outdone by Gladstone Octavia who is 8 horned. 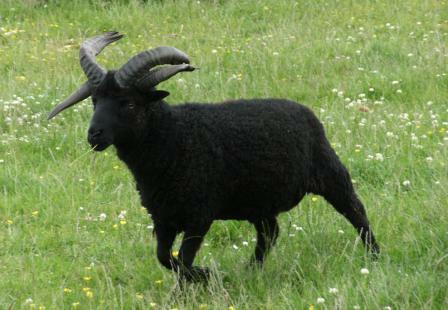 And yes, Octavia does have 8 horns - the first time this has been recorded in a Hebridean sheep. The horns may not be magnificent, but there are plenty of them (not the world's best photo but the only one we have of her as a lamb). As Octavia has grown up, the horns have tended to fuse together as there is not enough room on her head to have a gap between them all. Octavia has lambed in 2011 but her single ewe lamb has not inherited her dam's hornset. Polled ewe - no horns. Gladstone Brigitte was named after Brigitte Bardot in view of her splendid hairstyle. Note again her startling resemblance to the Storrs Halls ewes shown above. One of the very few topknot sheep in existence and our first, born in 2002. Our sheep stay outdoors all year round. Winters are long here in Scotland and being 1000 feet up we get plenty of wind, rain and snow. Hebrideans cope well with the harsh conditions and lamb outside on their own very successfully. The sheep have free access to hay and some browsing through the winter and each of our fields has a basic shelter which the sheep can choose to use if they so wish. In common with most sheep, Hebrideans will scrape down through the snow to get to the grazing below, up to a depth of about a foot. Hebridean sheep have established an enviable reputation for conservation grazing - grazing down scrub which would otherwise encroach on grassland and heathland. Here our Hebrideans enjoy eating the leaves and bark from a willow bough which was broken off one of our trees in the storm of May 23rd 2011. The sheep really relish this browsing and benefit by getting minerals and roughage. Hebrideans are not a breed to graze your orchard as they really love apple trees and would browse these in preference to eating the grass. This is what remained of the same willow bough the next morning. The leaves and bark have been completely stripped off. 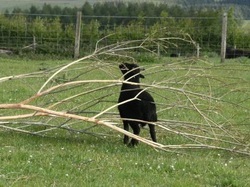 All we do now is leave the naked branches for a while to dry out then we use them as bean poles or firewood. It used to be that you could not register a 4 horned sheep if the horns tilted forward of vertical on the grounds that it impeded grazing. Here is a perfect illustration of how slightly forward pointing horns in a 4 horned tup do not impede grazing. 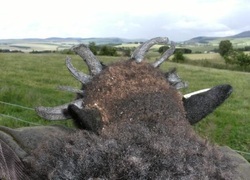 There is clear space between the tips of Gladstone Laughing Boy's horns and the grass which is being close grazed. It is interesting to note that the 2 horned tup's horns come just as close to the grass as the 4 horned tup's horns. 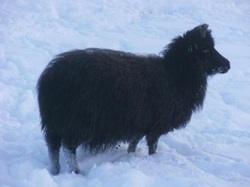 Hebrideans are descended from the old Scottish Shortwool or Dunface breed, a breed which came in all colours. 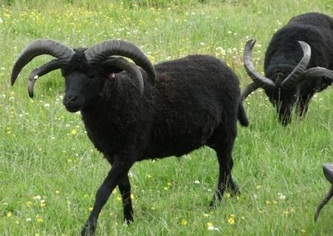 The current Hebrideans are black as only black sheep were originally selected to form the new breed. 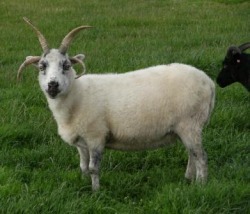 Up until 30 or so years ago, the Rare Breeds Survival Trust still recognised white Hebrideans which turned up occasionally, but since then it has not been possible to register them. Even a white spot on an otherwise pure black Hebridean makes it ineligible for registration. When we got the chance to buy Blondie, an example of an effectively extinct variety of the breed, how could we resist? 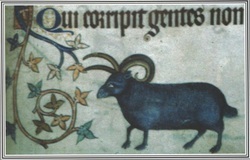 And finally, here is a 14th Century illustration of a 4 horned black sheep. 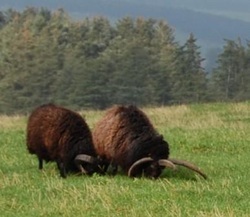 Note the slightly forward tilt to the top horns, an indication that this is an original characteristic. He doesn't look much different to the pictures above. Black Sheep of Windermere by Dr David JJ Kinsman. ISBN 0-9540283-0-9. Obtainable from Windy Hall Publications, Windy Hall, Crook Road, Windermere LA23 3JA. A comprehensive history of the breed by an acknowledged expert in the field. Hebridean Sheep Old Breed for New Times. ISBN 978-0-9563879-0-5. Published by the Hebridean Sheep Society. 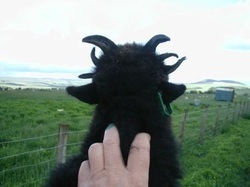 Obtainable through the Society website www.Hebrideansheep.org.uk. Everything a new enthusiast would want to know about keeping Hebridean Sheep with contributions by a number of knowledgable breeders.